Hurt and broken-hearted after a painful divorce, Audrey Blair picks up and moves to Nashville looking for a fresh start. Her faithful German Shepherd, Duke, helps Audrey and her two daughters settle in while Audrey focuses on her work as a vocal coach. Even though she’s currently at odds with her faith, Audrey takes a chance and applies for work at a Christian music label. She’s not looking for a relationship, but a game of fetch changes everything when her dog runs into Troy Jackson. Troy, the billionaire owner of Arise Music, is too handsome, too busy and too haunted by his past for a relationship. He’s intrigued with the new vocal coach who plays a dangerous game of fetch. Her musical abilities draw out a song that’s long been silent within him. Taken in by Troy’s kindness and chocolate brown eyes, Audrey’s heart shifts and she decides to give him a chance. Chasing fireflies with Troy changes the way she looks at the handsome billionaire and her heart feels like it’s finally on the mend. Troy finds himself falling in love with Audrey, but when the truth about his past comes to light, will Audrey’s faith be lost forever? 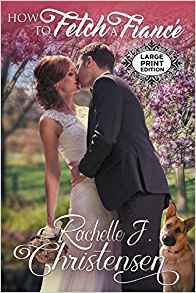 With their love on the line, Troy is willing to accept help from anyone—even Audrey’s dog, but it might require more than just a game of fetch to win her over.